During the introduction of this chapter, we showed an example where default automation (i.e. text-based automation) fails since it is based upon the absolute and relative screen position of UI-elements within the graphical user interface. This chapter introduces the simple, but a mighty concept of image-based automation and its easy application. 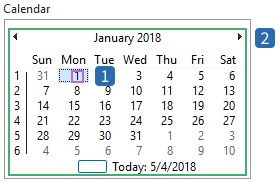 As shown during the introduction of this chapter, the test case is based on a calendar view which may change between the initial test recording and the test run(s). Now we record the previous test again and in image-based automation mode. Switch to Image based automation by activating the corresponding switch. Image-based automation differs from (default) text-based automation also in a graphical way. Ranorex Recorder outlines the identified UI-elements during recording with green frames (image-based automation) instead of purple frames (text-based automation). The test result, when running with the recording conditions at run-time, is the same as with the default text-based automation mode. Assume, again, the change of test conditions in a way, that the calendar view changes to a different month with the dates being at different positions and watch out the result of the image-based automation. Now see the test result of the recorded test with changed test conditions and a different calendar view. Nevertheless, Ranorex identifies the previously selected dates ’24’, ’25’ & ’26’ correctly!